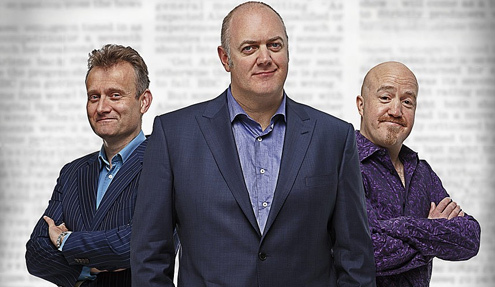 Mock The Week has been continuously scheduled on BBC Two since 2005 with older episodes airing on Dave. 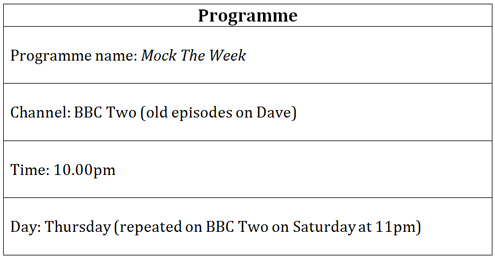 BBC Two has an older, more educated ABC1 target audience, sometimes referred to as ‘high brow’ that would appreciate the intellectual humour of the programme. BBC Two have retained the programme as after 10 years of being broadcast on the channel, it maintains ratings of 3.5 million which is creditable for BBC Two, but also evidencing commercial success within an era of multichannel television, digitisation and significant competition from other comedy news panel shows like the more historically embedded Have I Got News for You - this comedy moved from BBC Two to the more mainstream channel BBC One. The programme is a perfect match for the channel in terms of how it addresses the audience in relation to its content, which although not high brow suggests a level of understanding and awareness of national, and global contemporary news - a detailed breakdown of the target audience of both would evidence this with a primary demographic of ABC1, 35-55 aspirers, reformers and to a lesser extent individualists who are predominantly male, politically liberal or left of centre and with a social conscience.